If you know or love someone whose age is still in the single digits, this blog post is for you. If not, then move along. Nothing to see here. If a little one is in your life, then you probably already know Mr. Stilton, Geronimo Stilton. He's publisher of The Rodent's Gazette, Mouse Island's most famouse newspaper, and an author who's latest book, The Race Across America, finds Geronimo on a bicycle. If you're familiar with his oevre, you know that Geronimo is no George Hincapie at the start of this adventure. Far from it, unless George whines a lot and likes nice cups of hot cheddar -- neither of which is revealed in his tweets. 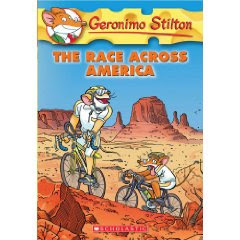 Along the way, Geronimo's book teaches young readers about the history of the bicycle, training for a bicycle race and the Race Across America. And needless to say, it's a whicker-licking-good tale, especially if you're in the single digits.